The confirmation of Betsy Devos today by Senate Republicans marks the end of quality education in the United States. 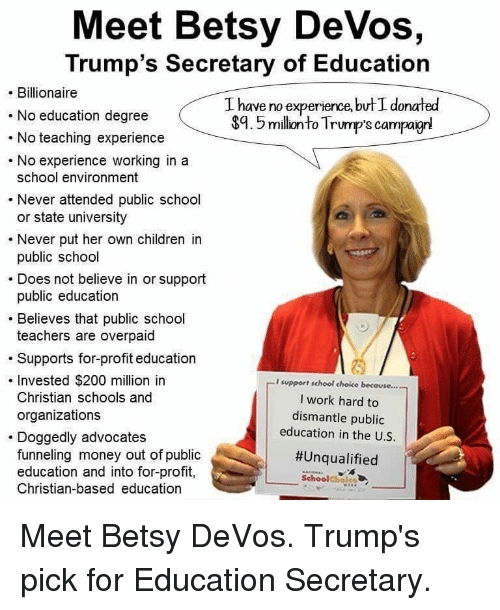 By any measure this woman is unqualified to even enter a public school, let alone run all of them. Seriously, putting a goat in charge would have been a better idea since the goat could possibly double as a school mascot. Apparently the only thing that matters in education going forward is your ability to buy a majority of congress-weasels.